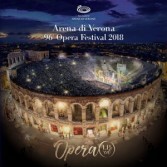 Arena Opera Festival 2018: the complete program of the 96th Verona Opera Festival The 96th edition of the historic Opera Festival on stage at the Verona Arena from 22nd June to 1st September 2018 for 47 evenings will be busy, together with the Arenean artistic and technical complexes , great performers of international fame. The Festival will be inaugurated by a new production of Carmen by Georges Bizet, one of the most represented in the world, to continue with great classics proposed in evocative settings, as well as the return of Nabucco by Giuseppe Verdi in the staging that inaugurated the summer season 2017. Arena Opera Festival 2018: the complete program of the 96th Verona Opera Festival. The program features five opera titles: in addition to Carmen and Nabucco, Aida by Giuseppe Verdi, Turandot by Giacomo Puccini and Il Barbiere di Siviglia by Gioachino Rossini . "